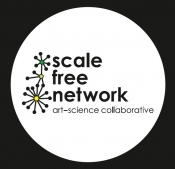 Scale Free Network (SFN) is an art-science collaborative and micro-publisher founded in 2007 by conceptual artist Briony Barr and microbial ecologist, Dr Gregory Crocetti. Based in Melbourne, SFN creates interdisciplinary workshops, participatory installations, educational resources and books for children and adults. We find it wondrous that 99% per cent of biodiversity on Earth is invisible to the naked eye, and decided to begin creating the Small Friends book series. Each book aims to create narratives and artworks that grab our readers’ imaginations while also doing thorough justice to communicating the complex science. Each science-adventure story focuses on symbiotic partnerships between microorganisms and larger life forms, and is created in collaboration different international and Australian scientific experts who offer in-kind support, advice, research material, images and feedback. The Small Friends series makes an original and distinct contribution to the genre of eco-literature. Indeed, we are yet to find anything that approaches the depth of scientific collaboration combined with a commitment to artistic values of our Small Friends books. Using beautiful illustrations and based in complex science, Small Friends books re-imagine the world from a microbial point of view. While targeting 7-12 year olds, the books are designed to be gorgeous artworks that appeal to curious minds of any age. We are interested in finding agents to represent us outside of the Australian/New Zealand market, so that we can sell the rights for our books to be published in other international markets and languages.